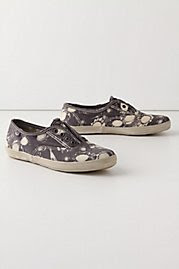 i bought a $5 pair of faux keds today at wally-world and i'm going for a broken-in, distressed, painter look. not that i want to look like a distressed painter, i want the shoes to look distressed. the distressed shoes of a painter. anyway, i hope it works! stay tuned for the results!! !